Monthly Minis #9 -- sign up now! Monthly Minis #9 are here! We are offering two options for Monthly Minis this time around...or feel free to do both! each package comes complete with the pattern, fabric kit, and buttons. Samples are on display in the shop -- super cute!! Just a quick reminder...Merry's Stash Society will meet THIS THURSDAY due to the Thanksgiving Holiday next week. We will meet early in December also, on December 17. 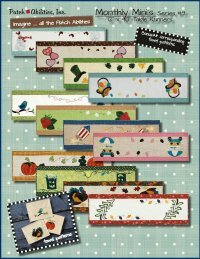 We are excited about this month's project...out of the new Little House on the Prairie fabric collection!! A big THANK YOU! to everyone to joined us for our Very MERRY Holiday Open House last weekend! If you weren't able to attend and missed out on the free pincushion kit, don't worry! We have them available in the shop and now on our website. Click here to order the "Stitchy" Snowman Kit. Happy Thanksgiving from all of us at Merry's Stitchins! Shop will be closed Thursday, November 26.